Built-in safety bar, contoured seat and Slip resistant textured flooring for added safety and stability. Door swings outward. A modern take on a traditionally rustic accent, the Uptown 2.0 Swing Shelf is a winner in both style and functionality. Handles are easily installed to accommodate two thick ropes, making it easy to adjust or add items to the two durable shelves. Whether used to display family photos, scented candles, or favorite plants, the Swing Shelf is perfect for showcasing all of your prized items, while simultaneously amplifying your home decor. Available in white. Wheel Chair Accessibles provide a safe and independent bathing experience. Using the latest in tub crafting techniques and industrial grade materials Wheel Chair Accessible Tubs offer an impressive line to meet your specific needs. With ADA compliant designs and features, Wheel Chair Accessible Tubs offer the satisfaction and peace of mind needed to truly enjoy a luxurious soak. The 5 ft. Left Drain Walk-In Bathtub in White provides a safe and independent bathing experience in a cost-conscious package. Using the latest in tub-crafting techniques and industrial-grade materials, this fiberglass walk-in tub from Universal Tubs offers an impressive array of features to melt away your worries and aches. With an ADA-compliant moulded bathing seat, safety grab bar and low-threshold entry, this tub offers the convenience and peace of mind needed for bathers of all ages to truly enjoy a luxurious soak. 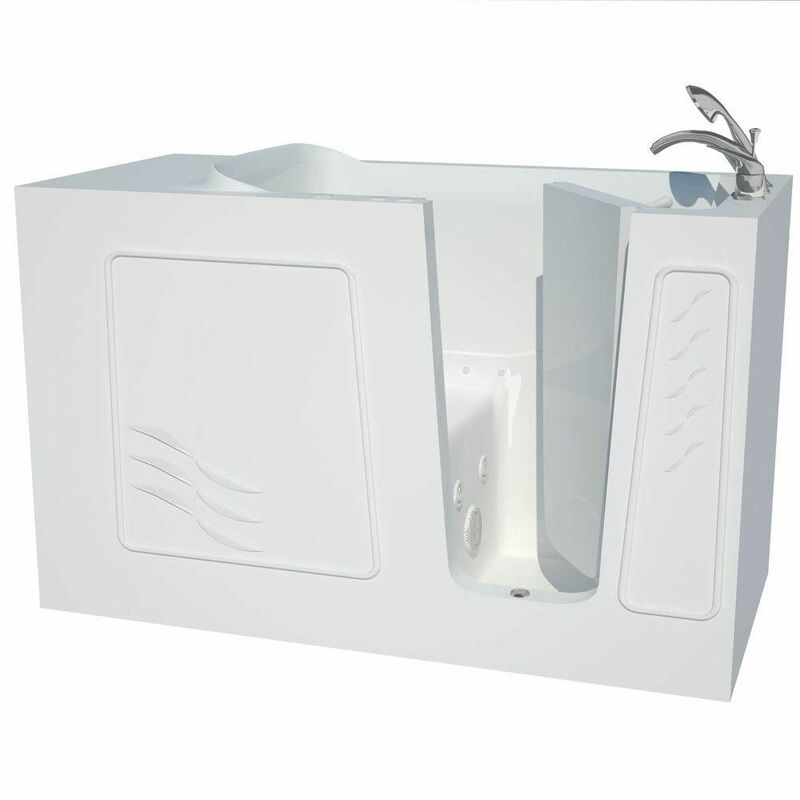 5 ft. Fiberglass Alcove Rectangular Right Drain Whirpool Walk-In Bathtub Outward Swing in White Walk-In's provide a safe and independent bathing experience in a cost effective solution. Using the latest in tub crafting techniques and industrial grade materials Walk-In Tubs offer an impressive line to meet your specific needs. Walk-In Tubs offer the satisfaction and peace of mind needed to truly enjoy a luxurious soak.